A small propeller mounted in a tube welded into the bow section of a narrowboat hull to aid maneuvering. 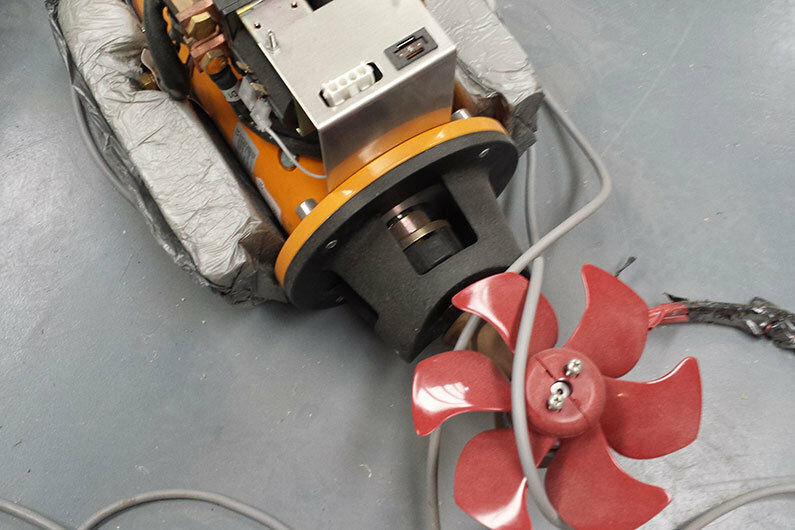 Narrow boat bow thrusters can be driven either electrically or hydraulically. Bow Thrusters… How Do They Work? A fully laden narrow boat is not the easiest of craft to manoeuvre, especially if it is of the widebeam type, and a bow thruster is a device built into the hull of the bow & used for making it more manoeuvrable. For many, the best type of bow thruster is the trusty barge pole but for many others the push or flick of a switch is a much more convenient way of turning the bow. 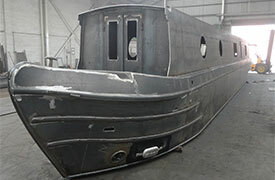 Bow thrusters can either be installed by your narrow boat shell builder or indeed can be installed retrospectively. This flexibility means that if personal mobility becomes an issue during boat ownership, life can be made a little easier without having to give up your pleasure. 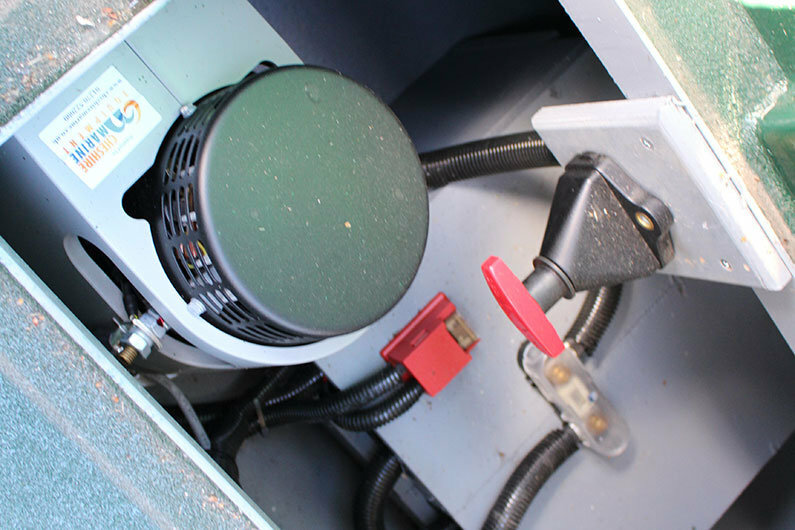 Bow thrusters are often installed as standard on high spec new widebeam canal boats, however always confirm this with your widebeam boat builder. Bow thrusters come in various guises, types and sizes but the basic installation and principles of operation apply. Essentially a transverse open tube is installed below the water line in the bow section. Into this tube, from above, is installed a small propeller, attached to a motor or gearbox. Controlled from the helm position at the stern, a flick of a switch will spin the mini-propeller one way or the other depending upon which way you want the bow to move. Some of the larger models are equipped with a twin propeller system for durability and extra thrust. Models are available that are either electrically powered or hydraulically driven. Some bow thruster manufacturers offer tables comparing the HP output of the motor to the narrowboat length, even offering output figures in kgf where they are attempting to give an approximation of thrust. Carefully consider your choice as bow thrusters are not only built for narrow boats. The marine market is huge, and with many components we represent a small part of a manufacturers turn over. In practice units starting at around 75kgf/4HP are commonly fitted to small boats with up to 10HP units for larger craft. If in doubt, speak directly to a manufacturers representative and seek best advice for your particular hull design, how deep in the water the tube can be fitted and your intended use. The bottom line here is that when considering a usable bow thrusting system, but the best you can afford & don’t cut corners. For every happy owner with a bow thruster there are two who have fallen out of love with their system due to abuse or servicing costs. There are some considerations for when choosing a bow thruster. Firstly, Do You Really Need One? There will always be divided opinion regarding bow thrusters (in much the same way as for toilet systems for example)! Good reasons include maneuverability for a widebeam craft on narrow waterways, limited mobility for crew & skipper, single handed boaters or just because you can. Having decided that, for you, the benefits outweigh the costs, size it correctly. 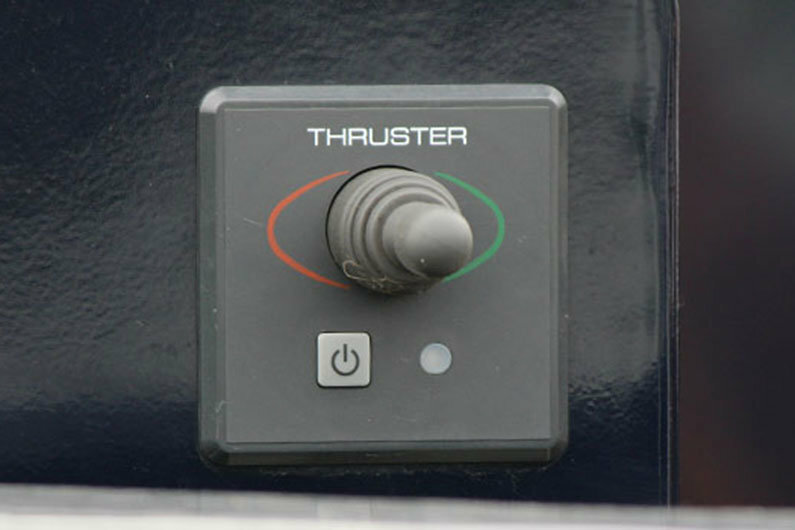 What we mean by that is that there are a variety of thrusters available on the market, mostly servicing the market outside of the inland waterways. 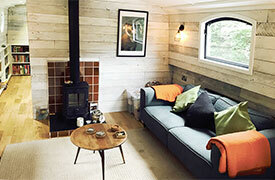 It is really only the heavy duty end of the manufacturers ranges that are suitable for our narrowboats. You may think that on still water with a shallow blunt bow that it wouldn’t matter too much. Think again. Over & over we talk about the harsh environment of our canals and rivers. Narrow boats are shallow drafted because the canals are shallow. The bottoms are layered with mud and rotting vegetation and often filled with rubbish. A small tube and propeller arrangement coupled with a low HP motor will soon burn out when entangled with someones discarded mooring rope or a plastic bag. Fitting grilles over the tube is one solution for preventing rubbish being sucked in but grilles can also become blocked and performance compromised. And Thirdly, Use The Right Components When Building Your System. It’s not only the actual thruster that has to be sized for the conditions and narrowboat size. It is essential that with electric units, the cables are of the correct gauge and that batteries that power the thruster are of the correct size. Due to the draw of current from the motor of a thruster, it is common practise to have the power source close to the motor in order to avoid the dreaded volt drop. 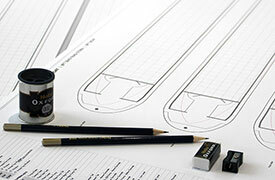 Therefore suitably sized batteries of the correct amperage are usually installed in a purpose built locker in the bow. Charging comes from the engine powered alternator via a split charge circuit in a simple system. 24V units are available giving installation wiring & battery options but whatever you install follow carefully the manufactures recommendations for use. Even smaller units will use 3000W motors which can become burnt out in a matter of minutes if abused and are a tremendous drain on stored battery power, which has to be replaced. Incorrectly specified wiring can overheat causing fire. Another consideration here is the replacement & servicing costs of another set of batteries. An option for those who want bow thruster benefits may be to fit hydraulically powered units to your narrowboat. Essentially hydraulically driven gearboxes, there are no complicated electrical motors to destroy or wiring calculations to contend with. What you will have to ensure is that there is sufficient hydraulic pressure available to drive the thruster. This is hydraulic pressure is conventionally supplied by an engine mounted hydraulic pump although pumps can be driven by a separate generator or even a DC motor, but expect losses in efficiency if driving a pump from a separate motor! As with most things, it’s probably best to keep the install as simple as possible in the interests of longevity and additional servicing costs so the engine driven pump system is usually a practical choice for most. If specifying a hydraulic system for your narrow boat, consider efficiency losses over long hose runs. Take advice from your equipment manufacturers representative to save grief and warranty issues further down the line. Hydraulic systems are more expensive and than an electric bow thruster but can be operated for longer periods of time. You have to decide how you are likely to use your thruster & if it is only for a few seconds here & there, giving a little nudge to the bow, then carefully consider if a hydraulic system is necessary. Larger, heavier widebeam boats may well find a benefit in a hydraulically powered system, especially if used in windy open waters regularly.